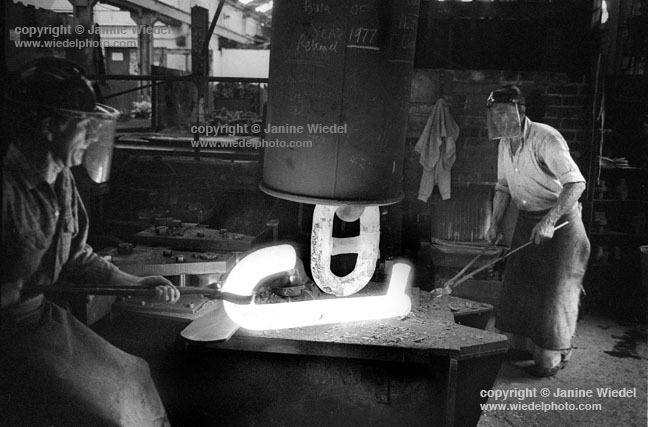 We are proud to announce we will be showing a selection of images from Chainmaking, Black Country, 1978, by documentary photographer Janine Wiedel, during our Industrial Might weekend, on Saturday 19 May, at the Black Country Living Museum. Janine Wiedel is an American documentary photographer and visual anthropologist based in London who has been covering issues of social concern since the late 1960s. Her career has mainly focused on groups struggling to survive on the edges of mainstream society. These projects have become major studies, books and exhibitions, and have fed into Wiedel’s extensive archive and photolibrary which contains a unique collection of stock images covering a wide range of social issues including: education, protest, youth, alternative lifestyles, multicultural communities and social exclusion. In 1978, Wiedel was awarded the West Midlands Art Bursary and spent 2 years recording Industries of the area including: Drop Forging in Aston, Birmingham; Shelton Bar and Bilston Iron and Steel Works; Chainmaking, in Cradley Heath; Coal Mining, and The Potteries in Stoke on Trent. The finished project “Vulcan’s Forge” was exhibited at: The Photographers’ Gallery, London; the ATV Centre, Birmingham; the Stoke-on-Trent Museum and Art Gallery; and was then toured by the Ikon Gallery, Birmingham. Other major projects/exhibitions have included: Black Panthers, Inuit of Baffin Island, Irish Travellers, Squatters; Protest Movements; and Multicultural Communities in London. Most recently, she and fellow photographer, Jacky Chapman, have photographed the refugees in Northern France. This exhibition/publication has been shown at Gallery 101, the International headquarters of the Salvation Army in London and is now travelling to educational institutions around the UK. To view Wiedel’s extensive photolibrary and to find out more about forthcoming exhibitions and publications, please visit: archive.wiedel-photo-library.com. Image copyright Janine Wiedel. All rights reserved.